An exquisite sleigh ride and dining experience at the beautiful Sleigh Ride at Lone Mountain Ranch. Please select 6 pm to book your reservation. This is a one seating event and no other times are available. Credit Card on File will be charged in full if cancellations are not made 48 hours before date of reservation. -Wine and beer for sale at the ranch, No outside alcohol. For over 35 years the Sleigh Ride at Lone Mountain Ranch dinner has been a cherished tradition. Guests are transported on horse drawn sleighs under star light skies to the North Fork cabin. 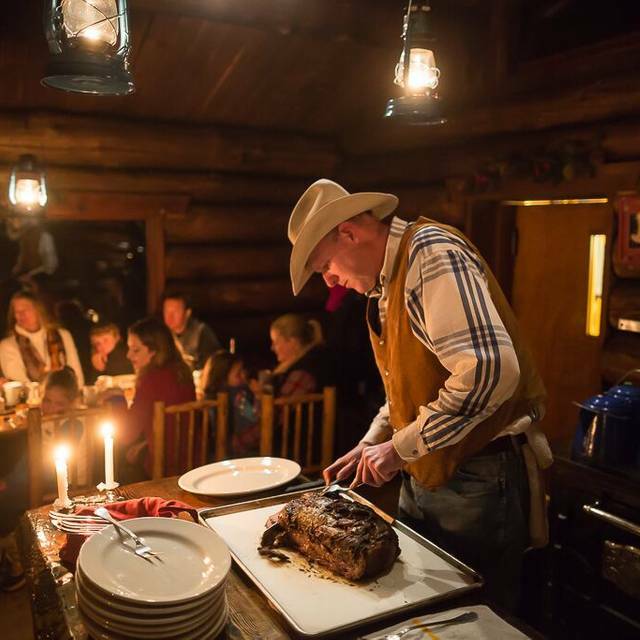 A very special prime rib dinner is served family-style in a room illuminated by oil lanterns and rounded out by the tunes of a cowboy musician. A festive atmosphere is fueled by the warmth of a 100 year old railroad cook stove and the close camaraderie of the dinner guests. The Lone Mountain Ranch Sleigh Ride embodies the wintertime spirit of Montana like no other. MAGICAL - The sleigh ride to the authentic cabin, the 5 star meal (best turkey pt pie and prime rib I have ever had) and the entertainment. We were a group of travelers from Toronto and Boston and had one of the most memorable evenings of our lives. We are world travelers so that says a lot! Great staff, food and environment. Highly recommend the dinner sleigh ride. The food was superb as was the staff. It was a very cold evening but with the blankets they provide we were warm. Rick was great! He not only took us in the sleigh but also has a great voice and performed during dinner. What an incredible experience!! Every part of the evening was amazing, from the beautiful sleigh ride to the delicious food and fantastic hosts. Lone Mountain Ranch is a very special place! We can't wait to return. What a great experience. The people were amazing and friendly. I celebrated my birthday and so glad I did it there. The venue was amazing, just wish the sleigh ride was a little longer. Overall pleased with the experience. Everything was fantastic! We had Lauren as our sleigh driver with Jessie and Frank pulling us along and they were all fantastic! The food was delicious and very filling and the music from Bruce was great! Overall an absolutely amazing experience! 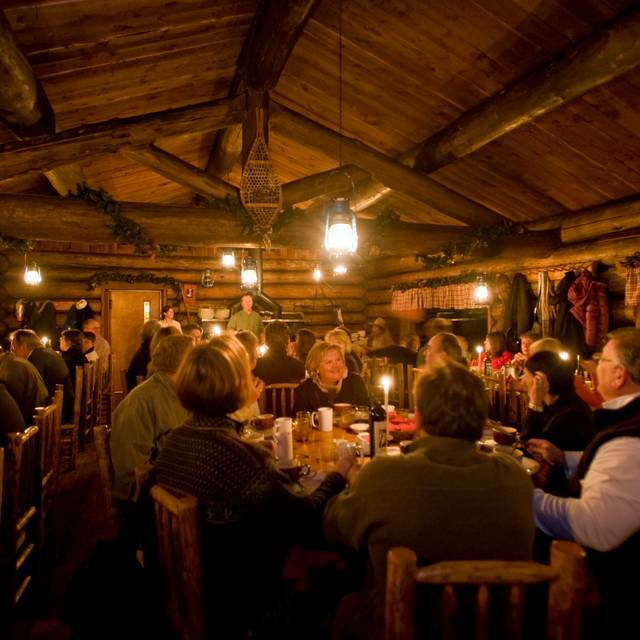 Definitely do this sleigh ride dinner while you are visiting in Big Sky! We were at Bit Sky for a ski vacation and this looked like fun. 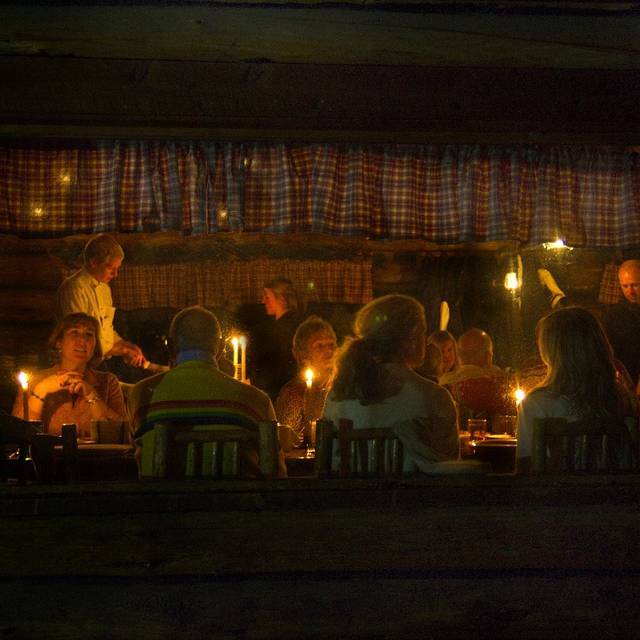 A very nice time overall with good food in an elegantly rustic cabin. Please be aware that the seating and service is family-style, so it’s a more appropriate experience for a larger group of friends or family. Not recommended for couples, as you can only chitchat for so long with strangers before it gets awkward or boring. Or, like us, get seated next to some obnoxious low-information guy wearing a Trump 2020 t-shirt. Yes that happened. There is a cowboy singer who was pretty good but really made the evening drag on. The whole event could be about 45 minutes shorter and it would be more enjoyable. The sleigh ride was pretty cool - amazing horses! Fun, special evening starting with drinks at the saloon and covered deck (additional charge). Then 20 minute horse-drawn sleigh ride through the woods to a log cabin, which was built about 40 years ago for this purpose. Provided blankets for the sleigh ride, though the seats are wooden benches without any padding. Food served family style at long tables. Menu included a potato-leek soup, smoked turkey pot pie, prime rib with mashed potatoes and roasted veggies. Generous amounts of each course and all the food was excellent. Ended with a fruit cobbler and ice cream and cowboy coffee. Musical entertainment included cowboy songs by Rick, who sang and played guitar. (Different performers during the week.) Only downside was a party that brought an infant and small children that were crying and screaming at times during the music. Enjoyed the spectacular star-studded sky on sleigh ride back to the ranch. Everyone and everything was great. I think it would be a good idea to have everyone take their blankets into the cabin with them so that they are not ice cold upon leaving. The ride down would have been much less uncomfortable (cold) if the blankets had not been freezing. This was a fantastic experience! I did this with my daughter which made it even more special. The service was superb in every way. My only suggestion for improvement is to improve the directions for catching the "shuttle" if you are taking free transportation from Mountain Village to Lone Mountain Ranch. You need to specify " Take the Big Sky Public Bus (can't remember the name of it) that can be met a the bus stop in the middle of the parking lot in front of The Summit Lodge. You will catch the bus that goes to Town Centre at 6pm - (or earlier at 5:15pm) as these are the only 2 buses that stop at the Lone Star Ranch. They will drop you at the Ranch and you want to enter the a-frame building to check in for the sleigh ride. If you arrive on the 5:15 bus, you will have time to enjoy a drink at the bar of the restaurant across from the barn. The bus will return following the sleigh ride dinner to return you to Mountain Village. Please do not take my suggestion verbatim - you need to confirm all of this and input accurate references, but being 2 visitors to the Big Sky area, the instructions lacked a lot of detail and we were very stressed out. Otherwise, the evening was incredibly enjoyable! We had a wonderful time on the sleigh ride, the food was delicious, and the staff were amazing! Shout out to Bruce our driver and entertainment for the evening. Guests visiting from out of town, everyone should experience st least once. I’m very glad my wife and I did this dinner. Overall, it was a magical evening. The sleigh ride through the forest was gorgeous at night. 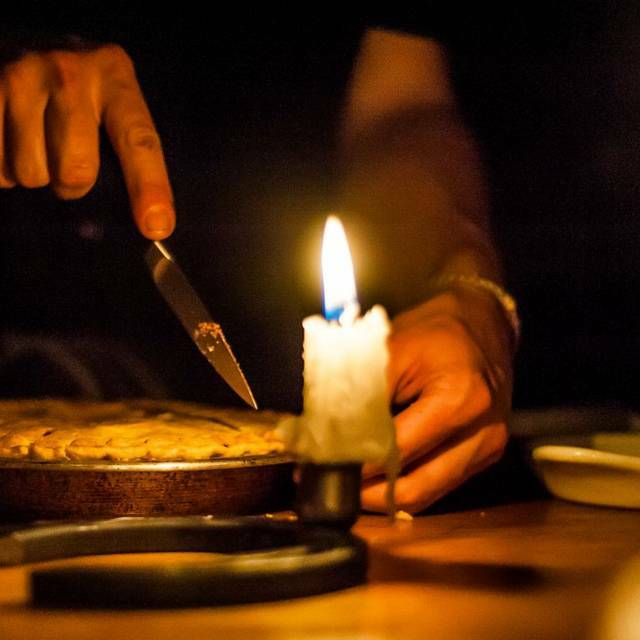 The food was solid and the ambiance of the cabin was very warm, welcoming, and comfortable. The live music was outstanding and the highlight of the evening in addition to the sleigh ride. Expensive, as it was well over $300 for the two of us, but I felt it was well worth it. Enjoy this special experience! The whole experience was amazing from the saloon in the beginning to the staff to the food. Had a blast. Magical night for whole family. Great food, sleigh ride, atmosphere. Entertainment was OK but not as good as in previous years We've been there several times, but not recently. The price has nearly tripled since our last visit. Sort of our price range anymore. Excellent evening as always. Sleigh ride is wonderful and the food and service is great. And Rick is great with the music. Our family had so much fun. It was definitely the highlight of our holiday season. And Bruce was fantastic. Everything was fabulous! The sleigh ride was so fun and our driver Jimmy was great. The food was delicious and the music was very entertaining. I loved everything about our evening. Fantastic experience. This is far more than just dinner. 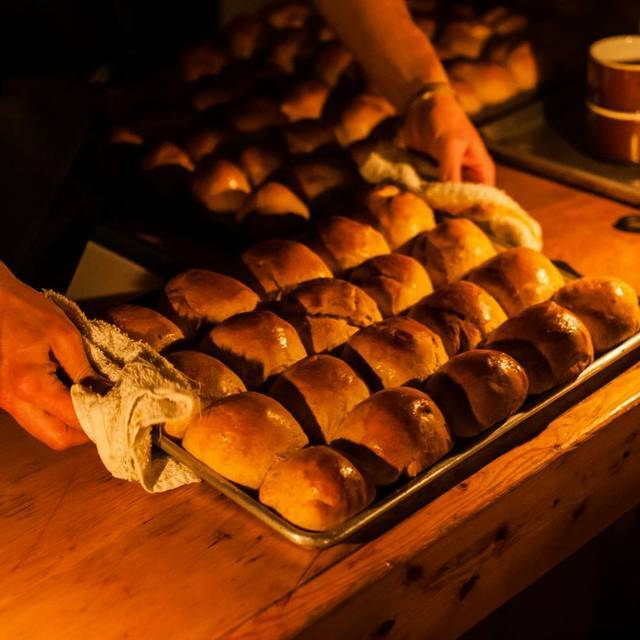 It is a memorable event between the sliegh ride through pristine snow covered woods to the off the grid rustic cbin for country music and a delicious dinner prepared on a wood cook stove. Cant say enough about how fantastic the entire crew was. Thanks and will be back! We have done the sleigh ride dinner 4 times now - the sleigh ride, horses, drivers, and Bruce the awesome singing cowboy were absolutely wonderful as usual. We were disappointed with the meal this year for the vegetarian option. This year I was given potato leek soup, then given butternut squash soup after I had eaten the potato leek, and told that the potato had a meat broth. Then instead of the prime rib I was served a cauliflower steak. So I had a popover, soups, a piece each of brussel sprout and broccoli, mashed potatoes, a cauliflower steak and dessert. Didn't seem as though that was worth what we paid ($140 or so plus tip.) We also had indicated this was for a birthday, and so was told "happy birthday" when we checked in and paid. It seems as though other years it was a little more festive at the cabin. Such a magical way to spend a winter evening. Loved the old west feel and the hosts and hostesses were perfect! Would recommend for a true Montana experience. A fun experience and some Montana ambiance. Dress warmly for the sleigh ride, but do layers as it is warm in the cabin. Arrive early for some drinks and check in at the saloon. In the past it was BYOB, now you must purchase their very overpriced beer and wines if you want some for dinner. Nice that you just place an order and it is at your assigned table when you arrive at the cabin for dinner. The sleigh ride seems very short, but I guess it’s enough to get a thrill. The whole evening is fun but a bit overpriced for what you get. Very nice. Second time on the sleigh ride. Just runs a little late as does not leave until 7 pm. We absolutely loved everything about this nighttime sleighride dinner. Tucked in the middle of the woods, driven by a horse drawn sleigh to a quaint cozy cabin for a fantastic prime rib dinner. I cant say enough great thinga about the whole night, the staff, the ambiance...it was exactly what i had hoped for! Awesome experience! The food and entertainment was outstanding. Definitely worth it to get to the saloon early to check in if you're not staying at Lone Mountain, as the check in can get a little hectic but the bar is awesome with a great outdoor area as well with a fireplace. This was our 2nd time to enjoy this authentic sleigh ride & dinner. A definite treat. I wish I could say that I enjoyed this meal as much as I have in the past, but it just isn't so. When we first arrived to the cabin there were not enough seats at our assigned table. The staff had to look at our card, and then agreed that we were at the right table and that there were not enough chairs or place settings. Once this was resolved, we were seated and the serving began. We first received a potato and leek soup, which was delicious, but the portions were not properly controlled. Two of the people in our party had a normal portion, while two others barely had two or three spoonfuls. Next, the vegetables and potatoes were served. The mashed potatoes were so salty that they were not good. The vegetables were just okay. The meat didn't arrive for another 15 minutes or more. I think most people prefer to eat the meat and vegetables at the same time. Some of the meat was very tough and not very tasty. The entertainment was good, as was the sleigh ride, but for the money, the meal was not good. If you want wine with your meal you have to purchase it at their saloon and pay nearly twice the price for it. This was our fourth time to do the dinner sleigh ride. The first two experiences were fantastic. Last year I noticed that it wasn't as good, but this year the experience just isn't worth the price anymore. Unfortunately, this will be our last trip to the Lone Mountain Dinner Sleigh Ride. Best sleigh ride dinner in the area! Loved our evening. The prime rib was perfection as was guitarist Bruce. This was our 2nd opportunity to enjoy this dining experience. It was so delicious. We will definitely do it again. However, it would be nice to know how much it costs before you get there. There is a big difference between $50+ and $135, which is what it was. Great food, lovely experience! Most cooperative with food allergies. Very enjoyable! Our family has been taking this sleigh ride to dinner in the cabin for about 20 years. It is always magical. We were quite impressed this year how well we were accommodated for those in our group with food allergies. It is quite difficult to make reservations, however, either directly at Lone Mountain Ranch or via Open Table. Also, Open Table gives you options for dinner times, but there is only one seating per night! Be advised if you want wine, you must purchase it at the bar up the hill from the check-in cabin. The food is steak, potatoes and veggies (so let them know if you are a vegetarian, etc. ), and the ambiance is spectacular, especially entertainer Bruce with his authentic cowboy songs and stories. Dress warmly for the 15-minute sleigh ride up to the cabin, which is heated by a stove (so dress in layers) and lighted by lanterns. There is no restroom in the cabin, just an outhouse. The dining is family-style, so you’ll have a chance to get to know others at your table. This is always a special night that our family looks forward to. It is a true Montana experience!